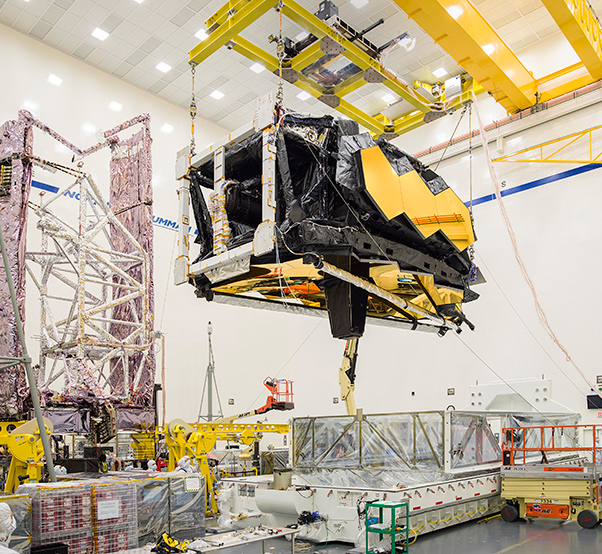 Engineers lift the combined optics and science instruments of NASA’s James Webb Space Telescope after removing it from the Space Telescope Transporter for Air, Road and Sea (STTARS) at Northrop Grumman in Redondo Beach, Calif., on March 8, 2018. 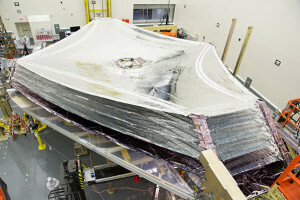 Webb’s science payload and spacecraft (which includes the sunshield that is also pictured here in its folded state) will be combined at Northrop before launch. Engineers removed the combined optics and science instruments of NASA’s James Webb Space Telescope from their shipping container in a high bay at Northrop Grumman Aerospace Systems in Redondo Beach, Calif., on March 8, signaling the next step in the observatory’s integration and testing. Northrop is the final step of Webb’s journey before it travels to its launch site in Kourou, French Guiana. Engineers will conduct final testing at the facility to ensure the observatory is ready for space. Webb’s combined optics and science instruments, the science payload, is the half of the observatory that includes Webb’s iconic, 6.5-meter (21.3-foot), golden primary mirror. The science payload recently arrived at Northrop after testing at NASA’s Johnson Space Center in Houston. The integrated spacecraft and sunshield — the other half of the observatory, which is in final assembly at Northrop — will soon undergo its own launch environment tests to prove it is ready to be combined with the science payload. Then, additional testing will be performed to guarantee the fully assembled observatory will successfully operate in its orbit at the second Sun-Earth Lagrange point (L2). The science payload was already separately proven to be able to withstand the rigors of launch and operate as expected at cryogenic temperatures through tests last year at NASA’s Goddard Space Flight Center in Greenbelt, Maryland, and at Johnson. Making sure every element of Webb functions correctly before it gets to space is critical, because at that orbit it will be beyond the reach of any servicing missions. Engineers open the interior tent frame of the Space Telescope Transporter for Air, Road and Sea (STTARS) at Northrop Grumman in Redondo Beach, Calif., on March 8, 2018, to reveal its precious cargo — the combined optics and science instruments of NASA’s James Webb Space Telescope. These final tests at Northrop are critical to making sure the fully assembled observatory deploys and operates as expected in space. Deployment is the most critical part of Webb’s journey to L2. To reach space, the telescope must fold origami-style inside its Ariane 5 rocket for launch. Once in space and detached from the rocket’s payload adaptor, Webb will unfold its sunshield and deploy its mirrors, including its highly complex primary mirror. It will be the first space telescope to complete such an intricate process. Opening Webb’s tennis court-sized, five-layered sunshield is one of the most technically challenging parts of deployment. The sunshield must delicately fold around the telescope for launch and then carefully open in space. Opening the sunshield requires that about 100 actuators, tiny motors that control the delicate motions of deployment, correctly fire. The sunshield must deploy successfully to ensure the mirrors and science instruments of Webb stay cold enough to be able to detect the extremely faint light of far-away planets, stars and galaxies. Meticulous testing ensures Webb’s success. 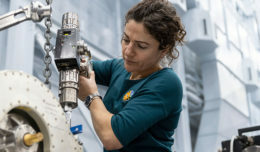 Webb has presented novel challenges, requiring innovative solutions from the multidisciplinary teams of engineers and scientists who have contributed to the international endeavor. Webb is the largest international space science project in U.S. history and one of the highest priority science projects within NASA. The most complex and largest space telescope ever built, Webb will answer some of the most fundamental questions we have about the origins of the universe. Webb’s many intricate systems are more complex than those of most spacecraft, and so the telescope requires thorough testing on the ground to ensure it will operate as expected in space and be able to fulfill its science mission far from Earth. 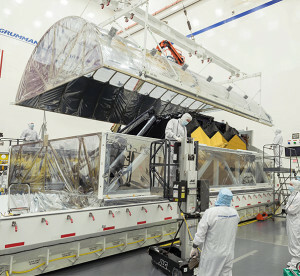 The sunshield of NASA’s James Webb Space Telescope sits deployed inside a cleanroom at Northrop Grumman Aerospace Systems in Redondo Beach, Calif., in October 2017. Building a complex observatory that is designed to deploy and operate in space presents several challenges. 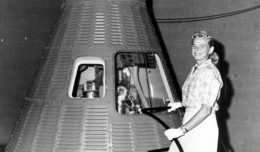 Webb’s optics and science instruments will operate at cryogenic temperatures in space, but they had to be built at room temperature on Earth. 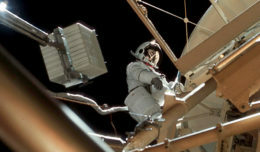 Webb’s mirrors had to be precisely polished and formed so they will achieve the correct shape when they cool in space. The sunshield will deploy in a zero gravity environment, but all deployment tests on Earth must contend with our planet’s gravity. NASA’s James Webb Space Telescope is the world’s premier infrared space observatory of the next decade. Webb will solve mysteries of our solar system, look beyond to distant worlds around other stars, and probe the mysterious structures and origins of our universe and our place in it. Webb is an international program led by NASA with its partners, the European Space Agency (ESA) and the Canadian Space Agency (CSA).